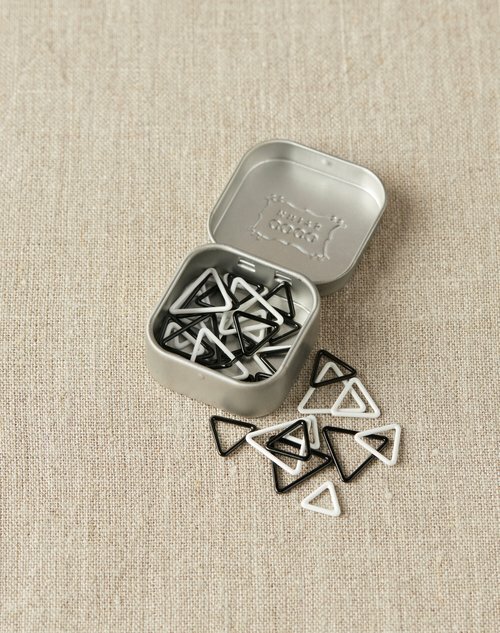 New Triangle Stitch Markers are designed with an angled shape to stand out from your knitting. They slide easily along your needle, and the bold black & white colors are visible against any yarn color. Each set of markers comes in an adorable logo-stamped steel tin with hinged lid - includes 6 of each size and color (36 total) and accommodates needle sizes up to US6/4mm, US9/5.5mm, and US11/8mm. Tin and markers all cling to the Cocoknits Maker’s Keep or any magnet. The tin is sized to fit on our Maker’s Keep. Throw in a few of your other Cocoknits markers for a perfect on-the-go knitting travel container!